This user's manual is designed to answer any and all questions about using gw2mb.com. If you finish reading this manual and feel some information is missing, send an email to proteininja@yahoo.com. The site administrator will answer the question via email and will update the user's manual for the benefit of future readers. If you decide to use the AutoHotkey scripts generated by this site, there are a few steps to complete before they will work. 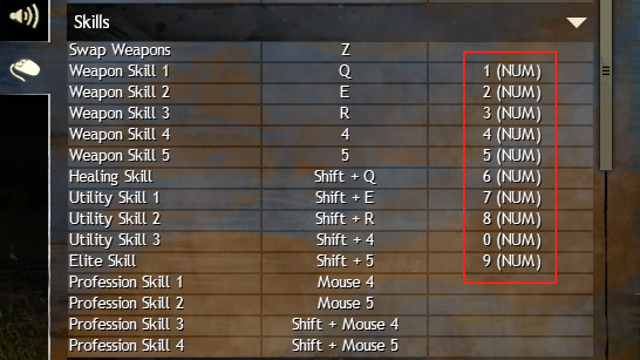 Add the hotkeys in the red box below to the in-game control settings (Ensure you use the number keys specifically on the NumPad). Some users have reported that autohotkey must be "Run as Administrator" in order to play notes in game. This is not always required. If you find that nothing is playing in game, but the script will print to a Notepad window, this may solve your issue. There are many different ways to trigger the scripts produced on this site. For example, each song could be assigned to a different hotkey using a custom AutoHotkey script. My personal choice is to put each song into its own file. Then, I pull out the corresponding instrument in-game and double-click the script file to play the song. If you would also like to use this technique, you can download a copy of my script template file here. The interface reference explains what each part of the song entry interface is for and how it behaves. Type the name of the song here. This is commonly referred to in music as the "meter". Each time the denominator is doubled, the speed of playback is doubled. This is commonly referred to in music as the "tempo". The higher the tempo, the faster the song. Checking this checkbox and saving the song will make the song appear in the archive. Any song previously saved by the current user can be loaded by clicking this button. Clicking this button will save the current song provided that all necessary fields are populated. The export song dialogue allows the user to copy either the manual or the AutoHotkey script to the clipboard. This button opens the user's manual, but I'm sure you figured that one out already. This button enables or disables the hotkeys. The hotkeys are described below. These hotkeys override the normal behavior of their corresponding keystroke. So, if you would like to use any of the keys below normally, make sure hotkeys are disabled. Adjust the volume of all audio played on the page. This does not effect your computer's or your browser's volume settings. Toggle between Play Mode and Combat Mode. In Play Mode, any notes played are not recorded in the song area. In Combat Mode, all notes are recorded along with their length multiplier. Clicking the music notes will play audio for the corresponding note value. In combat mode, the note clicked will also be recorded in the song area. If there is no text selected by the user, the playback button will play all the notes recorded in the song area. If the user selects a portion of the song the playback button will play only that part. Clicking it again while the song is playing will stop playback. Clicking these buttons will decrease or increase the current octave. This is the song area. The text here is in modified ABC Notation. When the song is saved, exported, or played back the notes located in this area are used. The note length multiplier is used to modify the default note duration. For example, if "Notes per beat" is set to "1/4", the numerator is one, and the denominator is two, the note recorded will be an eighth note. An eighth note is half the duration of a quarter note. Clicking the "Add Rest" button will make the instrument play nothing for the duration of the rest. Rests are considered to be in the current octave when they are added. This button only appears on the Harp, Lute, and Bell2. It enables and disables Chord Mode. 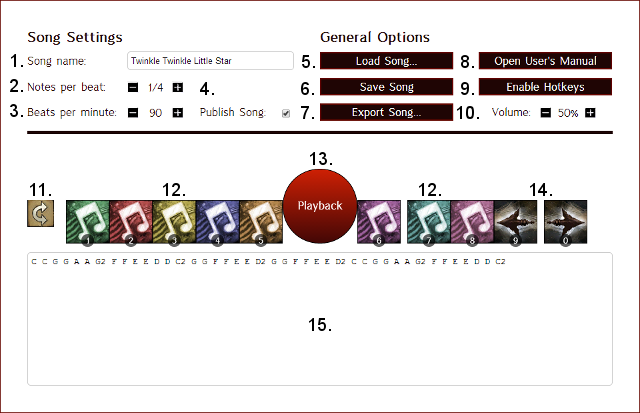 Chord mode allows the user to choose two or more notes that will be played simultaneously. When in chord mode, any notes played will be added to this list until chord mode is disabled, the chord is added, or the note is played again. Additionally, notes can be individually removed from the current selection by clicking. Clicking "Add Chord" will add a chord to the song area comprised of all selected notes. The note selections will then be cleared. Creating a song is relatively simple once you know what all the buttons do. First, navigate to the corresponding page for the instrument you would like to compose for. There you can set up the song settings (song name, notes per beat, etc). Next, sound out the tune in Play Mode. Once you are confident you know the tune, you are ready to record. Toggle combat mode on. If you wish to alter the note length, you will need to change the note length multiplier prior to playing the note. Continue to play until the whole song is recorded. If you make any mistakes, you can just delete the wrong note and continue recording. It is important to note that each note must be separated by at least one space. Make sure you keep this in mind when deleting sections of your song. Once you are satisfied with your song, you can use the "Export Song..." button to copy one of two scripts to your clipboard. The first script is the manual script. This is intended for sharing on forums like reddit.com. It does not include note length multipliers. It is meant to be used by those who would like to play the song manually in-game without the aid of AutoHotkey. The second script is the AutoHotkey script. This is meant to be pasted into an AutoHotkey script file and used to play the song automatically in Guild Wars 2. This file can be used as a starting point if you are unfamiliar with AutoHotkey. Simply replace the text inside the file with the script copied from this site and save. Then, with the instrument drawn in-game you can double-click the file to begin playing the song. If you would like to share your song with other users who come to this site, you can check the box that says "Publish Song". This will make your song appear in the archive for all to enjoy. Each instrument has its own limitations that may lead to songs on this site playing improperly in-game. By respecting these limitations users can make music that sounds the same on this site and in-game. Each instrument has a maximum speed at which it can play notes. From slowest to fastest the instruments are bell, flute, horn, bass, lute, harp, bell2. If a song exceeds the maximum rate of play, notes will be missed and the song will sound very strange. If you experience this when testing your own songs in-game, a quick and easy solution is to reduce the "Beats per Minute" in the song settings. Octave changes have separate cooldowns from notes and are longer than the cooldowns for notes. This site already tries to minimize the number of octave changes when creating a script. If you find the song is still changing octaves too quickly a simple "Beats per Minute" reduction can be the answer. The horn instrument must use the escape key to end notes. Unlike the flute, it does not have a dedicated button for ending a held note. This sometimes leads to the options menu opening and closing during playback. You can ignore this for the most part, but make sure you close your inventory and other windows before playing a horn song. Otherwise, the escape key will be used to close any open windows rather than end the current held note. Finally, some songs simply cannot be played on Guild Wars 2 instruments. Some songs require sharps or flats to play. Some songs are just too fast. The best we can do is to create an approximation or move on and try a new song. This section is for techniques that myself and others discover to use the tools on this site more quickly and effectively. Rests can be used to change octaves without playing a note. The horn, flute, and bell all have cooldowns on octave changes that can be avoided by using rests to preemptively change octaves. Try using the mouse to change the note length multiplier and the keyboard hotkeys to enter notes. This can make song entry very fast. If you want to playback a certain portion of a song, select the text and click the playback button. The first time a note is played on this site it may lag a bit. After each note is played once, this will go away. The lag is simply your browser downloading the audio file for the first time. If you see strange errors on the site or strangely placed images, double check that you have the most recent version of your internet browser installed. Also, this site is not coded or formatted for mobile or tablet devices. If you are in the middle of editing a song and want to start from a clean slate, simply refresh the page. The search box in the archive can search all song fields including username. I will add more to this list as more ideas come to me. The drums are "quantized". This means that notes that are played by the user are moved into predefined timing slots by each client. Basically, every user hears something a bit different when you play your drums. Also, the drums already have the ability to record beats and play them back. The combination of these two facts is what led me to not include them on this site. How can I delete songs or remove them from the archive? If you no longer want a song to appear in the archive, you can save the song with the "Publish Song" checkbox unchecked. If you no longer wish to see the song when you click "Load Song...", overwrite it the next time you make a song. To overwrite a song load the song you wish to overwrite and replace all of the fields with your new song.